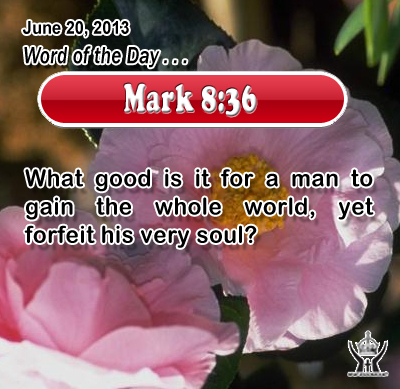 Mark 8:36What good is it for a man to gain the whole world, yet forfeit his very soul? Heavenly Father, help us to keep our priorities right, our life holy, and our heart open to your will rather than being blinded with our own self-seeking. In Infant Jesus' precious name we pray. Amen. 7"And in praying do not heap up empty phrases as the Gentiles do; for they think that they will be heard for their many words. 8 Do not be like them, for your Father knows what you need before you ask him. 9Pray then like this: Our Father who art in heaven, Hallowed be thy name. 10 Thy kingdom come. Thy will be done, On earth as it is in heaven. 11 Give us this day our daily bread; 12 And forgive us our debts, As we also have forgiven our debtors; 13 And lead us not into temptation, But deliver us from evil. 14 For if you forgive men their trespasses, your heavenly Father also will forgive you; 15 but if you do not forgive men their trespasses, neither will your Father forgive your trespasses. God is kind and forgiving towards us and he anticipates us to treat our neighbor the same. Do we treat others as they deserve, or do we treat them as the Lord would care for us with his grace and favor and mercy? Jesus’ prayer comprises an injunction that we must ask God to forgive us in quantity as we forgive those who have wronged us. Ask the Lord to free our heart of any anger, bitterness, resentment, self-interest, indifference, or coldness towards others. Let the Holy Spirit fill us with the fire of his burning love and sympathy and with the river of his overflowing mercy and compassion. Heavenly Father, you have given us a mind to know you, a will to serve you, and a heart to love you. Give us today the grace and strength to embrace your holy will and fill our heart with your love that all our intentions and actions may be pleasing to you. Give us the grace to be generous in thought, kind in deed, and loving in speech towards everyone.